One (1) UNIVAC Sperry Rand Series 70 sign. 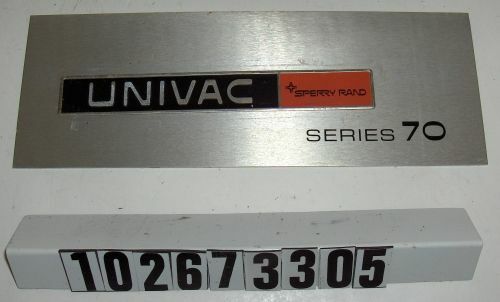 Sign consists of a rectangular piece of silver tone metal with a black and red, metal label affixed at the center that reads "UNIVAC, SPERRY RAND." "SERIES 70" is printed in black at the bottom-right corner of the sign. The back of the sign is covered with hardened adhesive residue.